Ce chalet de vacances est situé sur les lacs Bras d'Or sur une baie isolée, à seulement 5 minutes en voiture de Baddeck, des terrains de golf et l'entrée du sentier Cabot. Cet endroit familial dispose d'une petite plage, d'un quai et d'une zone de baignade à usages multiples. L'eau n'est pas froide - 70 degrés +. Du plaisir pour tout le monde! Internet sans fil est maintenant inclus pour une connexion 24/7 à «votre monde» au besoin - encore débrancher lorsque vous voulez vous détendre, et profiter de cet emplacement paisible au bord de l'eau. Pratique drive- 5 minutes à Baddeck. Situation centrale pour les visites touristiques, la randonnée, la pêche et les après-midi de plage. À moins d'un kilomètre, empruntez le sentier Cabot pour visiter l'île du Cap-Breton et tout ce qu'il a à offrir! Le club de golf Bell Bay et le site historique Alexander Graham Bell sont à seulement 5 minutes en voiture, avec de nombreuses plages, sentiers et randonnées à proximité! Les golfeurs voudront se rendre à moins d'une heure de route, aux deux véritables parcours de Bandon Dunes à Inverness: «Cabot Links» ET «Cabot Cliffs»! Planifiez un voyage dans la région de Sydney et visitez Fort Louisbourg - profitez de l'histoire. Pour les musiciens - assurez-vous de visiter le Collège gaélique ou les restaurants locaux et les pubs qui mettent en vedette de merveilleux artistes de l'île. Retour au Boat Cottage - Un endroit merveilleux pour se réunir à la fin d'une journée bien remplie. Détendez-vous et regardez le soleil se coucher sur la baie. Planifiez vos prochaines vacances maintenant! The property was fantastic with lots of space for everyone. Our family enjoyed the cottage and with it being so close to Baddeck it was ideal. We would definitely stay there again. We loved this cottage in Baddeck! Tons of room for the 8 of us and so well equipped right down to the great games selection. Rustic in the most beautiful sense. Lovely location on the lake. Jan was wonderful to deal with all respects with very prompt response and great tips on things to do. We would highly recommend this cottage and hope to be back before long. We chose this for a 50th anniversary get-together with family members, and what a wise choice. Sleeping areas are quite private, but there is plenty of common space without anyone feeling crowded, even room to do a 1000 piece jigsaw puzzle and not be in the way of anyone else's activity. We appreciated the abundance of towels and kitchen equipment. The resident hare didn't seem to mind our presence. What a joy to wake up in the morning with that view! We are so glad you enjoyed Cape Breton and stayed in Baddeck at our Boathouse! Wonderful base for a family celebration! Our three-generation family celebrated our 50th anniversary at the Lakeside Boat Cottage, and it was a wonderfully comfortable place for all of us to relax in the cushioned wicker furniture and window seats, cook in the well-equipped kitchen, eat together at a table accommodating us all, and sleep in beautifully furnished and comfortable bedrooms. It was also a conveniently central location to the various activities we wanted to take in, from the western side of the Cabot Trail to Ft. Louisbourg in the east. It is beautifully situated with great views of the lake and made a lovely setting for our family photo shoot. We also swam from the dock and the pebble beach and enjoyed the hammock and outdoor chairs. Since I, Grandma, did the booking, I was delighted when our children thanked me for finding such a great place! They loved the outdoor views upon arrival, and they commented on how the interior decor and presence of family photos made us all feel like we were sharing a much-loved family home rather than a generic place furnished from the big box stores. Jan, my contact person, was extremely helpful from the start, quickly answering all my questions, sending me a map of Cape Breton and activity brochures, and providing porta-cribs and an activity saucer for our 14 month old and 8 month old grandsons. They along with our 3 year old grandson all enjoyed the wonderful array of toys available. The mothers of these little boys were especially grateful for the washer and dryer in the cottage, which they used daily. The housekeeper was available for any questions we had upon arrival, and she responded quickly and helpfully while giving us our privacy. One of the owners was living in the house next-door, and he also greeted us and was helpful but in no way intrusive. He shared a little of the history of the cottage in their family, which added to our sense of a family-friendly atmosphere. We felt well supported by those with local knowledge throughout our stay. I would not hesitate to highly recommend this cottage to anyone looking for a quiet but accessible base for their Cape Breton visit. I'm sure you will find it delightfully comfortable and enjoyable, as we did. We are so glad you all explored our island and found our cottage comfortable for your family stay! Let us add our congrats for a 50th anniversary! Please return anytime . We stayed here for just under a week. Great set up and much larger than advertised. Easily accomodated our group of 4 adults and 3 kids. Fantastic views from all the rooms and very close to Baddeck. Good fishing off the dock where we caught striped Bass every night. This is an easy referral to give. 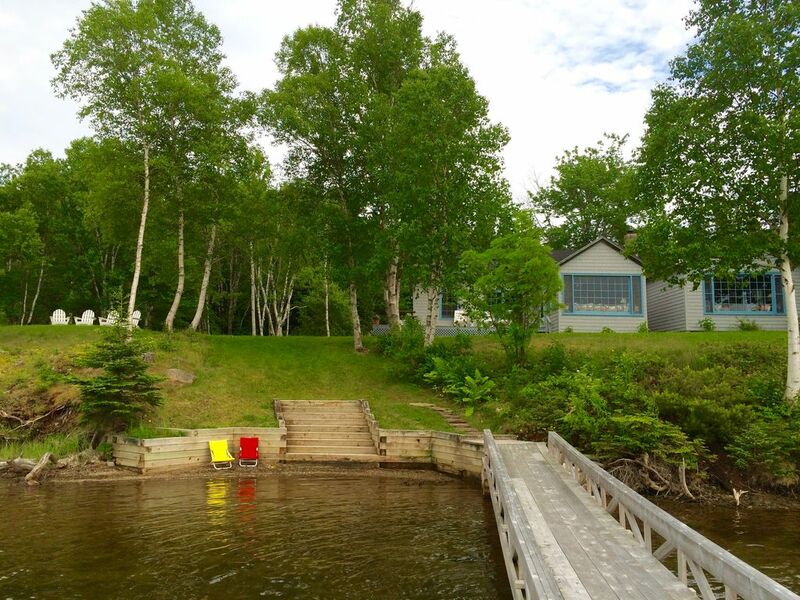 Great location just out of Baddeck. Kids first impression as drove done track was ' Brilliant' and within 5 minutes they were swimming off deck. For them the swimming included seeing starfish, crabs and fish and catching a few before throwing them back. Property lovely inside and well maintained. Setting was such that there was little need to head out in the evenings rather we sat and watched the sunset over the lake. Great location to travel throughout the Cape. Fortress of Luisburg, Skytrail and Ingenosh were all within 90 minutes. Luisburg was fantastic as was the trip to Bird Island from Englishtown. Another highlight was the bald eagles being fed from the boat! Baddeck was easily accessible and while we didn't venture out much in evenings the Bell Buoy restaurant was good and there is a nightly Ceilidh. Caretaker was easy to access and wifi great. Would recommend this cottage as a great central location to roam far and wide across Cape Breton.